The magnificent twin staircase, chandelier and portrait of Empress Maria Theresa. Named after an Empress and christened by Princess Anita von Hohenberg, great granddaughter of Archduke Franz Ferdinand, S.S. Maria Theresa – the sister ship to S.S. Antoinette and S.S. Catherine – has an impeccable pedigree. 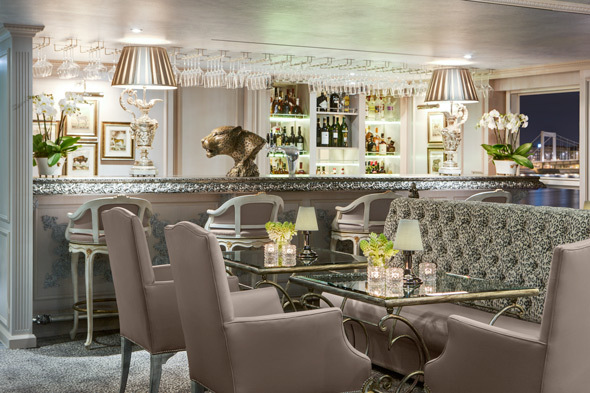 The ship evokes the classic, opulent style of the Austrian empire, but with pleasing contemporary touches. 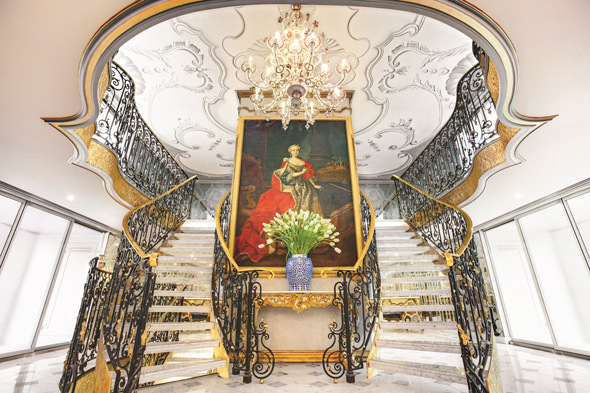 The marble atrium sets the tone for the rest of the ship: there’s a magnificent crystal chandelier and painting of the eponymous Empress Maria Theresa, and a splendid twin staircase. 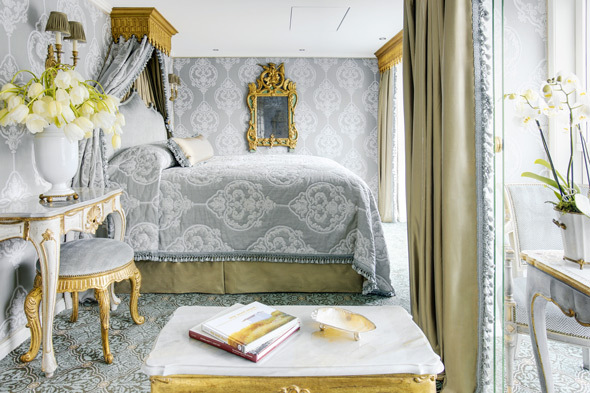 The ‘regal’ theme is continued throughout the ship – there are even little crowns on the stateroom doors; yet while grand, this is also a supremely comfortable ship – a home away from home, albeit one that’s designed to resemble a floating palace. Staterooms feature the signature Red Carnation hotels décor, including Savoir of London beds, which are so plump and comfy it’s like sleeping on clouds: even a princess would struggle to find a pea under these mattresses. 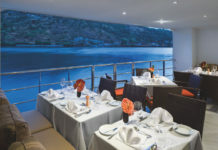 A suite decorated in Uniworld’s ‘regal’ style. The rooms are furnished in pale blue, gold, cream and white, with distressed mirrored wardrobes and a mirror that cleverly doubles as a flatscreen TV and ‘infotainment centre’. There are touch controls (some slightly confusing) for absolutely everything, from the lights to the blinds to the balcony window and underfloor heating in the marble bathrooms, which feature good-sized showers and space to move around. L’Occitane en Provence products, plush towels, towel warmer, bathrobes and slippers are welcome finishing touches. Suites on board S.S. Maria Theresa are uniquely decorated and have additional amenities and services, including butlers, packing and unpacking assistance, Nespresso coffee machines and fine teas, fully-stocked mini bar, free laundry and shoeshine service, bottle of wine upon arrival, Hermés bath products, one-per-person in-suite wellbeing treatment, and a special dinner in Bar du Leopard. 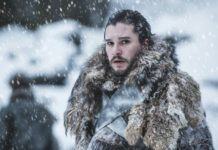 And if you really do want to be treated like an Emperor or Empress, then the Royal Suite offers additional benefits, including a separate and spacious living room, and a bathroom with a separate rain shower and tub, as well as a secluded toilet and bidet area. The lounge on board S. S. Maria Theresa. 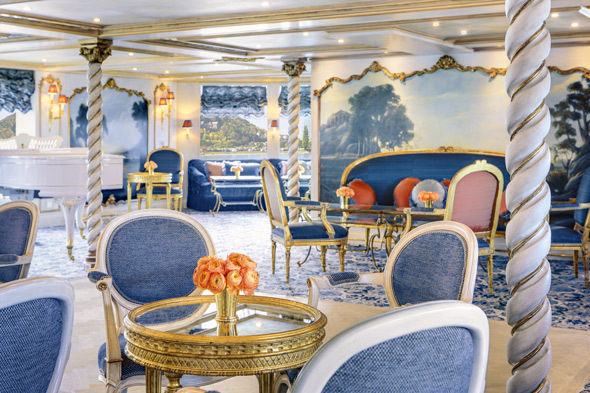 All the public spaces on S.S. Maria Theresa are exquisite, with exacting attention to detail that ensures every guest will feel as though they’re experiencing something very special. The Habsburg Salon, the venue for the excellent afternoon tea – very welcome after a day’s sightseeing – is an appealing open space with a large bar and sofas and chairs furnished in rich fabrics. The Lipizzaner cinema is small but perfectly formed, the ideal place to relax and watch a movie or listen to a talk, and the café next door is utterly charming. The main dining room is light and airy, and strategically placed mirrors ensure it never feels crowded even when every seat is full. While the spa is really a stateroom, the masseur is outstanding and highly recommended. The Bar du Leopard on board S. S. Maria Theresa. Most delightfully of all, on S.S. Maria Theresa the popular Bar du Leopard becomes the ‘snow’ leopard bar with a calming, neutral colour palette in white and soft grey, instantly creating a cool, elegant vibe; the ideal spot for a few pre-or post dinner cocktails, with an al fresco area for warm evenings. The heated swimming pool, while not quite big enough for laps (or perhaps more than one person at a time) is a tranquil space for relaxing – plus there’s a button which means you can instantly ‘frost’ the windows to avoid anyone else peering in while you take a dip. The bar’s very own swimming pool. 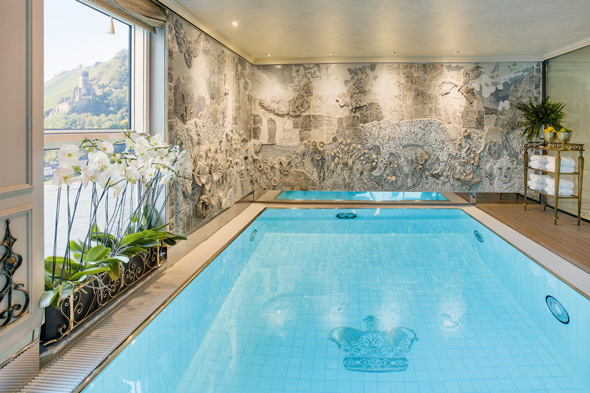 S.S. Maria Theresa is a design triumph, a welcome addition to the Uniworld fleet. GETTING THERE: S.S. Maria Theresa is cruising the Danube on the European Jewels voyage from Budapest to Amsterdam, a 15-day all-inclusive itinerary, with departures from March to November. 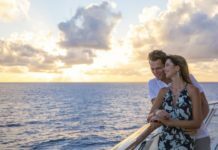 Prices start from £3,699pp departing on 6 November 2016, for bookings made by 31 May 2015, and include 14 nights’ all-inclusive cruise, flights, transfers, excursions and Titan’s VIP Home Departure Service. For more info visit titantravel.co.uk/uniworld or call 0800 988 5873.